ALL BACK IN STOCK for the Holidays!! 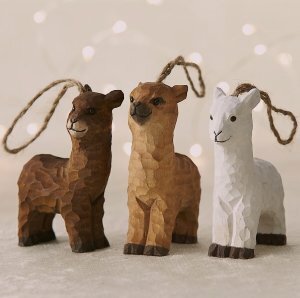 Hand made, hand painted, choose one or all the trio of alpaca wooden ornaments to start your own herd! 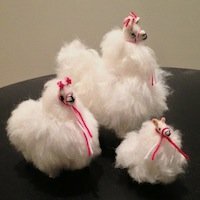 Not just for the holidays, these alpaca put a smile on your face!! The textural carving is a sweet representation of their fluffy coats. Composition: Linden wood, also known as Basswood, painted with water-based paint. Jute cord for hanging.